DARC’s Juniors squad sent two entries to the National Schools’ Regatta over the weekend of May 25th to 27th 2018. Taking place for the second year at Eton Dorney it is the largest junior rowing regatta in the United Kingdom, offering 6-lane racing to competitors from 14 to 18 years of age. The event was established in 1947 and attracts over 5000 competitors each year over the 3 days of racing. With numbers increasing annually J14 and J15 events take place on Friday, followed by Championship events on Saturday and Sunday. The J15 boys’ coxed quad of Matthew Harrison, Dominic Crilley, Ben Brown and Thomas Taylor, coxed by Ellen Eames (pictured left), was one of 61 entries in their event and finished 30th in the time trial, completing the 1000 metre course in 3m 35.06s. From an entry of 26 the J14 girls octuple then secured a 12th place finish in their time trial, completing the 1000 metres in 3m 47.53s. This put them into the B final later the same day, where the crew of Georgia Abbott, Alice Davies, Miriam Stewart, Ruby Coe, Lydia Kind, Niamh Lang, Ellie Goad, Amy Slater + cox Libby Morris (top) took 4th place (10th place overall) in a time of 3m 40.46s. Results and video footage of the WJ14 8x+ final can be found here, while the J15 4x+ time trial results and video are here. This entry was posted in Racing News on May 29, 2018 by Colin Lawson. The draw for Durham City Regatta is now available. Please ensure that crews and coaches read the Competitors Instructions in conjunction with the Saturday and Sunday draws. This entry was posted in Expired Announcements on May 9, 2018 by Colin Lawson. 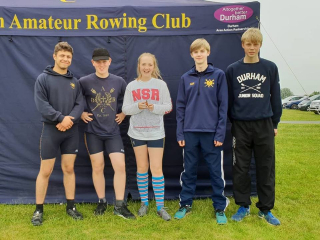 Entries for Durham City Regatta are now closed. The draw will be published here on or after May 8th 2018. This entry was posted in Expired Announcements on May 3, 2018 by Colin Lawson.